Today, I was surprised to find an advertisement for a loan on my screen when I launched Quicken. This is totally unacceptable. My suggestion is that you remove this annoyance immediately. From time to time, we will show members offers that may benefit them. In the future, there may be a management system for these, so you can see the offers you want to, but as of now, there are no plans to change this feature. Or at least give an opt out option and/or place it in the ADD-ON SERVICES tab (currently only in QWin). I could not agree more. This is crazy when people happily pay a fee for a good product only to see ads "IN" the product. I don't mind if you send me the occasional promotional newsletter but don't clutter my net worth with sleezy advertising!! Pls remove this "feature" asap. Absolutely ridiculous spam. If you don't stop this I will simply stop using your software and I have been a user of Quicken since 1995. This is complete disrespect for your customers and totally unacceptable. Make sure it doesn't happen again because if it does I'm out of here. I agree. This was not a good move. It got me to come here and vote and post. I echo these comments 100%. DO NOT ADVERTISE TO ME within a product I have purchased. This is totally unacceptable and I respectfully request these ads be removed NOW! Pop-up advertising is unexpected and unwanted when using Quicken. As a paid subscriber (not shareware, freeware, trial) I do not recall authorizing third party advertisements. Please cease and desist. Thank you. 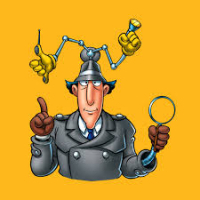 Saw this for the first time today....What it looks like, below.. This one happens to be a Capital One ad. What ads are you getting? How are you (Quicken) using my private data to send me targeted ads for my paid-for software application? Is the "Remind Me Later" check box, in the ad, an Opt-Out for ALL future ads of any advertiser? How do I opt-out permanently? My paid-for desktop application is NOT your webpage. Ads are not welcome. Monetize Quicken for the Web if you like but not my desktop. I got the same one- This is a really cheap shot! The poor person I got at tech support. In the past I have dumped products because of this no matter how much I liked/used them. I killed it so fast, I think it was for a bank product. I got the same ad for an online bank account in Quicken for Windows. NOT HAPPY! I do not pay a subscription fee in order to receive ads! Please stop doing this!!!!! To continue using Quicken we have been forced into a subscription model (vs. the upgrade when compelling to the customer approach) and we "get" to see ads popup upon launch of the app. What a crummy experience, really not much better than Mint in that regard. Agree. Hate it. I will NEVER patronize any of these vendors. Agreed. Total BS. Get rid it or lose your customers. @Quicken Kathryn , Any response on this issue? There has been several discussions on this problem but no response from Quicken. Can you give us some information on why we are getting spammed when using our paid subscription? Is there a way to turn this annoying function off? Notes were just updated by someone at Quicken ... but the status remains the same. 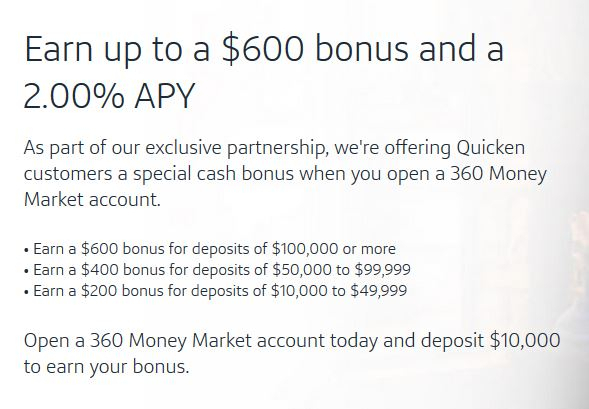 Just to add some context and explanation for those puzzled or angered by the appearance fo the Capital One offer, Quicken entered into a multi-faceted partnership with Capital One last year, and this ad/offer for a special bonus to Quicken users who open a Capital One money market account is a piece of that. Quicken doesn't see this as an ad for a random product, they see it as an "offer" which has tangible potential value for its users. Part of the partnership with Capital One last year involves creating some Quicken-branded products that have tangible benefits for Quicken users. And note that it's not Quicken "users," but Quicken "members" in the text of the message -- and I think that's the key insight. 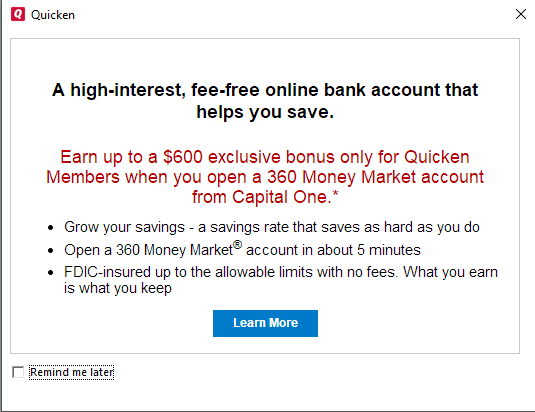 Quicken is trying to make membership have benefits (to steal an old line from a different credit card company!) that go beyond just licensing the software. Members are more likely to be loyal customers; members have multiple reasons for continuing their affiliation. 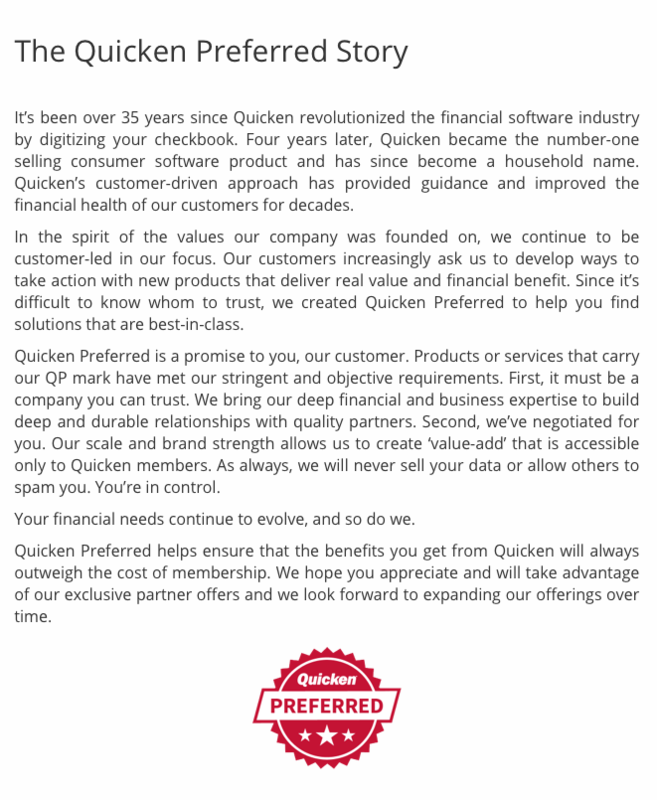 We typically use the words users, subscribers and members as synonymous, but I think Quicken's long game here is to try to build more value in being a Quicken subscription member. That, I think, gives you an idea where this is headed: a growing portfolio of Quicken-branded or Quicken-approved products which provide special deals for Quicken members -- any of which might provide bona fide value for some Quicken software users. So if you think this pop-up is something they might just flip off if people complain, I'd say to think again, because this seems to be a piece of a much larger strategy for the company. That's why the note from Quicken in the voting box at the top of this thread says there are "no plans to change this feature." Note the wording: they want people to see it as a feature, a potentially useful offer instead of an ad which is an intrusion/annoyance. Clearly, they need to do a much better job of explaining this to Quicken users, and to make the user experience less frustrating (e.g. allowing users to turn off or limit offers, putting them in a menu rather than a pop-up, or otherwise making it less bothersome to users). Open a 360 Money Market account by 11:59 p.m. ET on July 31, 2019. To qualify for the bonus, you must have received an email about the promotion directly from Quicken. If you have or had an open savings product (excludes CDs) with Capital One on or after January 1, 2016, you’re ineligible for the bonus. $200 bonus — you maintained a daily balance of $10,000–$49,999.99 for the first 90 days following the Initial Funding Period. $400 bonus — you maintained a daily balance of $50,000–$99,999.99 for the first 90 days following the Initial Funding Period. $600 bonus — you maintained a daily balance of $100,000 or more for the first 90 days following the Initial Funding Period. Argh - Subscription and ads. Yuck. Wow, I've been with Quicken since quicken98. It's sad that it will be no more. So, it looks like it's just a single ad, potentially, because of a partnership with CapitalOne. I've got no problem with Quicken looking for ways to generate more income by offering "features" to their paying customers. That said, here's the thing; the software model has changed to be subscription-based. This yields a more consistent revenue stream than the old model and comes with it, in my opinion, a different expectation by their customers. Offering ads/features/preferred partners, whatever Quicken wants to call it, when not opt'd-in (or minimally, offering opt-out) of current and all future "offers" is a poor customer experience.